Ninja Kitchen System 1500 VS Ninja 1100 - What's New? Ninja products are top quality appliances that make cooking easier and healthier. Getting nutrients from fresh fruits and vegetables is easy with Ninja blenders. Ninja originally introduced the 1100 Kitchen System. It has recently updated this version to a Ninja Kitchen System 1500 model. Here is a comparison between the two units. Both units are made to be tough, durable, and versatile. They offer professional results and allow a person to emulsify foods, crush ice, chop and dice fruits and vegetables, create frozen treats, and make pastry dough. The 1100 model has three speeds plus a pulse button. The 1500 model will also have a variety of speeds plus a pulse option. Both Ninja blenders will provide more power than the competition. The 1100 model supplies 1,100 watts of power. Likewise, the 1500 model will provide 1,500 watts of power and a two horsepower motor. Both of these items will be able to crush ice and create nutritious smoothies. Most conventional blenders will not have this ability. Both the Ninja 1100 and Ninja 1500 contain razor like stainless steel blades. Unlike other units, these blenders contain two sets of blades. The top set is used for crushing and chopping. The bottom blades are used to ensure a smooth and even consistency. Both Ninja blenders are simple to clean after use. They have parts that can be placed directly into the dishwasher. These include the lids, blades, and attachments. This will save a great deal of time in the kitchen. Besides the motor speed, the included accessories are the biggest difference between the Ninja 1100 and Ninja 1500. The 1100 model will come with a 40 ounce bowl with lid, dough hook, dough paddle, whipping attachment, and 72 ounce container. The 1500 model will include a larger 64 ounce bowl with blade, dough hook, 24 ounce mini prep bowl and blade, two single serve cups with lids, and a single serve blade. Both units have bowls that are constructed from BPA free plastic. This means that no harmful chemicals will leak into the food. Anyone who is single or does not want to create large quantities of food will appreciate the small container. Also, the individual cups with lids will come in handy for the person on the go. It will save time and money creating a healthy breakfast smoothie with the ability to take it in the car to work or to the gym. The Ninja 1100 blender has a sleek design and will provide great function. The motor allows a person to blend, puree, or mix any type of food. This means that salad dressings, smoothies, and pastry dough can be created with ease. This machine comes with an affordable price and is relatively less expensive than similar brands. It retails for $149. Along with the positives, there are some negatives to mention about this unit. For example, it is not meant to function as a true juice extractor. In order to get the proper consistency, it will be necessary to add water to the pulp. Also, it is not equipped to heat soups from cold ingredients. The Ninja Kitchen System 1500 is extremely versatile. It will be able to replace several other appliances that take up space on the counter top. It also will help a person make the most out of his or her time. The powerful motor will blend and crush in seconds. For instance, it is possible to mix pizza dough in under 30 seconds. On the downside, this unit is not meant to extract juice either. It is considered a multi purpose blender that finely grinds pulp into a smoothie consistency. It is also a bit noisy due to the powerful motor. Finally, the cost is a bit higher than the other units at $199, but the end results and great features may be worth the extra investment. 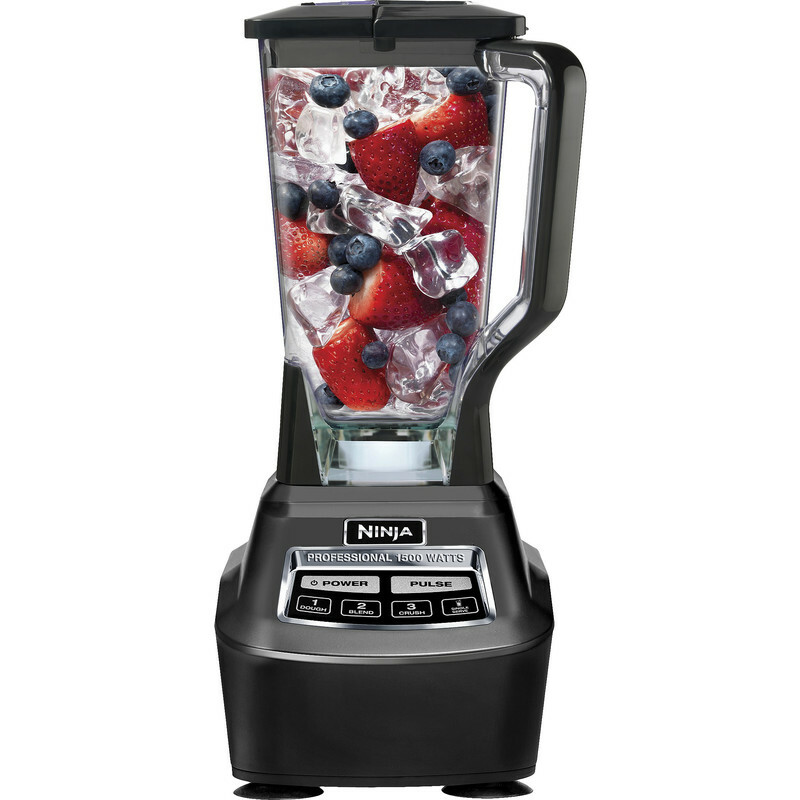 Both Ninja blenders are top appliances that deliver great results. The 1100 model is acceptable for a person who wants decent power and function. However, the newer 1500 model will provide better features. The Ninja 1500 Mega Kitchen System is the most powerful blender on the market. It will help prepare food quicker than ever. It is possible to insert entire fruits or vegetables into the unit and receive finely chopped results. Its great strength is one of its biggest assets, but it can also be gentle on delicate foods. The 1500 system will provide multiple blending options. It comes with both a large pitcher, a smaller bowl, and two single serve cups with lids. It is very versatile and can replace multiple kitchen appliances. Even though the price may be a bit higher, all of the features will top other high end brands, Anyone who can afford the extra should definitely choose the newer Ninja Kitchen System 1500 model.